What's Up With Montessori and Fantasy Play?! Alex was three when she started our Montessori school, many years ago. Her mom was a baker and had her own bake shop in town. Alex pretended to bake with everything and anything at school, as would be expected. But at the same time, she had to do the materials correctly, for one important reason, the other kids noticed when she did not! They would go up to her and say, "Alex, you are not supposed to do that with the pink tower!" You might think it was the teachers who got upset about Alex's behavior. No, it was the children, as they are so sensitive to order! They are like little policemen in the classroom! It was at this time we were creating our outdoor classroom. We had a sandbox and we made sand toy works for Alex (and the other children). 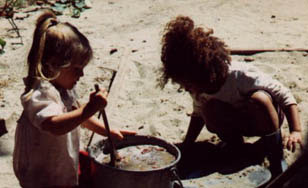 We got a few dishpans, placed pots, pans, bowls and wooden spoons in each of them, and they became outside works. The rule, of course, was to put the work away when they were finished. And it was not a banging work, a throwing work, etc. Alex never left the sandbox! She also loved worms, and we had a giant compost in the yard. As one of our outside works, we had child-size work gloves and shovels for digging, or turning, the compost. Alex loved it! And when she found worms, it was like someone finding gold! One of the most powerful learning tools for a teacher, and mom, is to observe the child. Especially when they "fantasy play." From their behavior, you can get ideas for activities to make, that lead them to constructive play. Let me give an example. On our practical life shelf we had a stove work. My director found it in a shop, it was a little stovetop made of wood with little knobs on the front; and it was small enough to fit on a rug or table top. However, the stove was hard for the children to carry, so we put drawer handles on each side of it. On top of the stove was a plastic container with two small pots and a small metal scupper. Inside one of the metal pots was some large pasta for scooping. The stove is a practical life work. A child can take the stove off the shelf, bring it to a rug, take out the pots, place them on top of the stove, take the lids off, and scoop the pasta from one pot to the next (it was a spooning work!). The younger children loved this work! But it is only for scooping and spooning. They can pretend to make soup, boil eggs, etc., as long as they do the work correctly (they don't throw the pasta, they don't bang the lids together, or mix it with another work). Because who would notice such a breech? The other children! Fantasy play in young children, I have observed over the years, is about mimicking the adults. The problem I see is there is no beginning, middle, or end. There are no clear limits or boundaries. Children at such a young age (ages 2 to 5) need limits and boundaries, they demand it without knowing they demand it. Each activity in the Montessori environment needs limits and boundaries: a beginning, a middle, and an end. The stove we made into a practical life activity had the boundaries of the stove top itself, and the rug; it had limits (we only scoop and spoon back and forth). It had a beginning: the child gets out the work and places the two pots on the stove; a middle: the child scoops back and forth as many times as he wishes; and an end: the child puts the pots and scupper back in the container and the container back on the stove and the stove back on the shelf. Children of this age relish order and routine. Make (or remake) your home activities with this in mind! You may also be interested in my Montessori and homeschool programs for birth to nine-year olds at Montessori for the Earth.